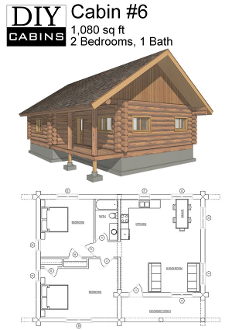 Log Cabin #6 is a 1,080 sq ft cabin with 2 bedrooms and 1 bathroom. This 2 bedroom cabin is cozy and comfortable, maximizing the space. A 2 sided 6'x20 log porch makes a great entrance and sitting area.